Michael, his father Jeff and his sister-in-law, Christina joined us last Friday for a little fly fishing on the Little Red River. Michael an Jeff are from Syracuse, NY., while Christina is from Texas and all are here with other family members for a little family reunion.IMG_0480IMG_0479 IMG_0476 IMG_0477 They were all first time fly fishers so you would think it might take a little while to get comfortable with a fly rod and some of the techniques for successful fly fishing. 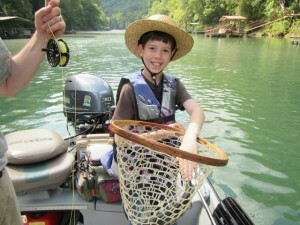 It took all of three minutes for ten year old Michael to get hooked up to his first fish on a fly! 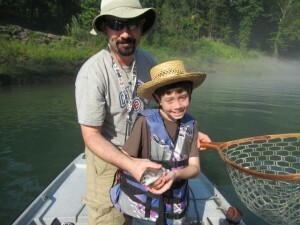 After a quick photo we cut the fly, a #16 White River Sowbug, off the leader and stuck in Micheal’s hat. 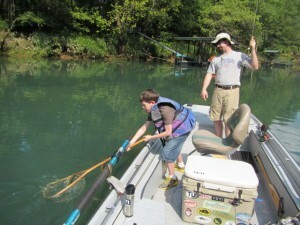 It was not long before everyone had their first fish on fly to the net. It was one of those wonderful mornings on the Little Red River when the fish are on and it really does not matter what fly you present, just get it in the water. We met the rest of the family on the river for a big picnic lunch. After a wonderful outdoor meal we all did a little wade fishing and everyone that tried managed to hook up with a little Rainbow Trout. 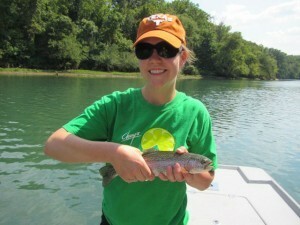 All in all it was just a wonderful family day on the river!